Bahnsen on Miracles: What Makes a Theist? Quote from Greg Bahnsen in his closing remarks in a debate with Dr. Gordon Stein (Stein representing the atheist position). Audio and printed transcript available here. You have said that there has been no adequate evidence put forth for God’s existence. What for you personally would constitute adequate evidence for God’s existence? Stein: Well, it’s very simple. I can give you two examples. If that podium suddenly rose into the air five feet, stayed there for a minute and then dropped right down again, I would say that is evidence of a supernatural because it would violate everything we knew about the laws of physics and chemistry. Assuming that there wasn’t an engine under there or a wire attached to it, we can make those obvious exclusions. That would be evidence for a supernatural violation of the laws. We could call it a miracle right before your eyes. That would be evidence I would accept. Any kind of a supernatural being putting it into appearance and doing miracles that could not be stage magic would also be evidence that I would accept. Those are the two simplest way. I would also accept evidence that logically non-contradictory, and I have not heard any yet here tonight that hasn’t been offered already. Bahnsen: Dr. Stein, I think, is really not reflecting on the true nature of atheism and human nature when he says, “All it would take is a miracle in my very presence to believe in God.” History is replete with first of all things which would be apparently miracles to people. Now, from an atheistic or naturalistic standpoint, I will grant, in terms of the hypothesis, that that’s because they were ignorant of all the calls of factors and so it appeared to be miracles. But you see that didn’t make everybody into a theist. In fact, the Scriptures tells us that there were instances of people who witnessed miracles, who all the more hardened their heart, and eventually crucified the Lord of glory. They saw his miracles, that didn’t change their mind. People are not made theists by miracles. 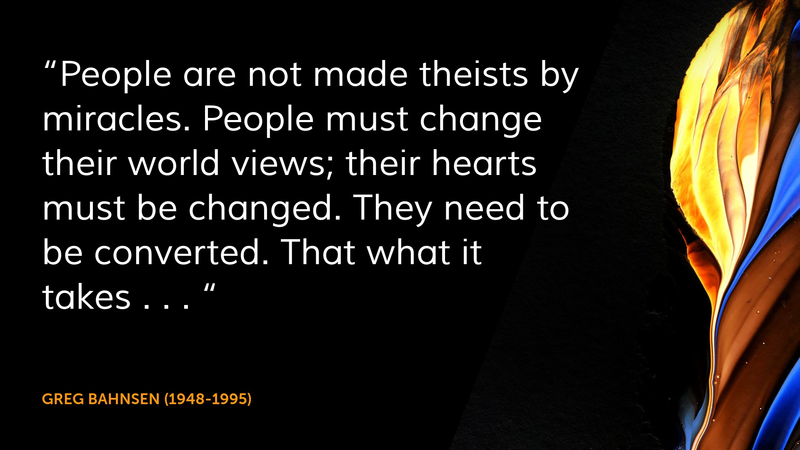 People must change their world views; their hearts must be changed. They need to be converted. That what it takes, and that’s what it would take for Dr. Stein to finally believe it. If this podium rose up five feet off the ground and stayed there, Dr. Stein would eventually have in the future some naturalistic explanation because they believe things on faith, by which I mean that they believe things as which they have not proven by their senses.